One of the most prominent Greek and European Leaders of the 20th Century. 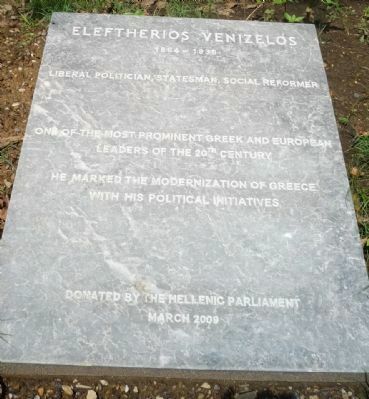 Erected 2009 by Hellenic Parliament. Location. 38° 54.72′ N, 77° 2.997′ W. Marker is in Sheridan-Kalorama, District of Columbia, in Washington. Marker is on Massachusetts Avenue, NW east of Sheridan Circle, NW, on the right when traveling west. Touch for map. 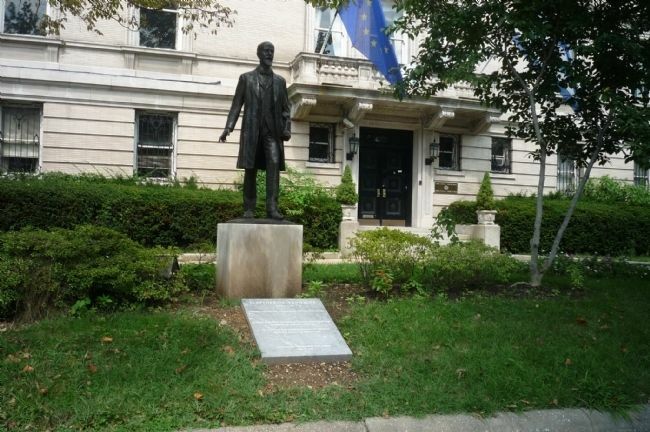 Marker is at the base of the Eleftherios Venizelos statue in front of the Embassy of Greece - on Massachusetts Ave. between Sheridan Circle & 22nd St., NW. Marker is at or near this postal address: 2228 Mass. Ave. NW., Washington DC 20008, United States of America. Touch for directions. 2. 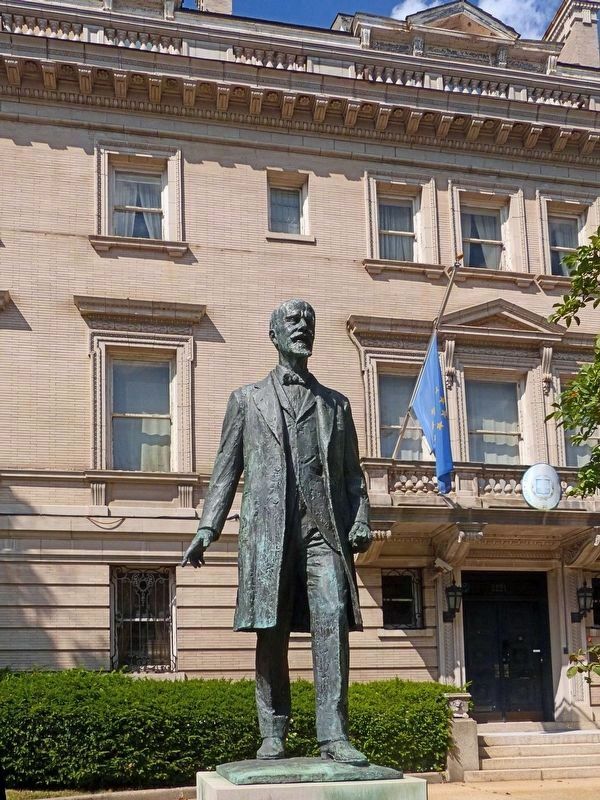 Eleftherios Venizelos Statue - Washington, D.C.
(about 300 feet away, measured in a direct line); Mustafa Kemal Ataturk (1881-1938) (about 300 feet away); George Washington (about 300 feet away); Liberation of the Grand-Duchy of Luxembourg (about 300 feet away); Dr. Philip Jaisohn, 1864-1951 (about 400 feet away). Touch for a list and map of all markers in Sheridan-Kalorama. Additional keywords. Crete; Balkan Wars; Embassy of Greece; Embassy Row. More. 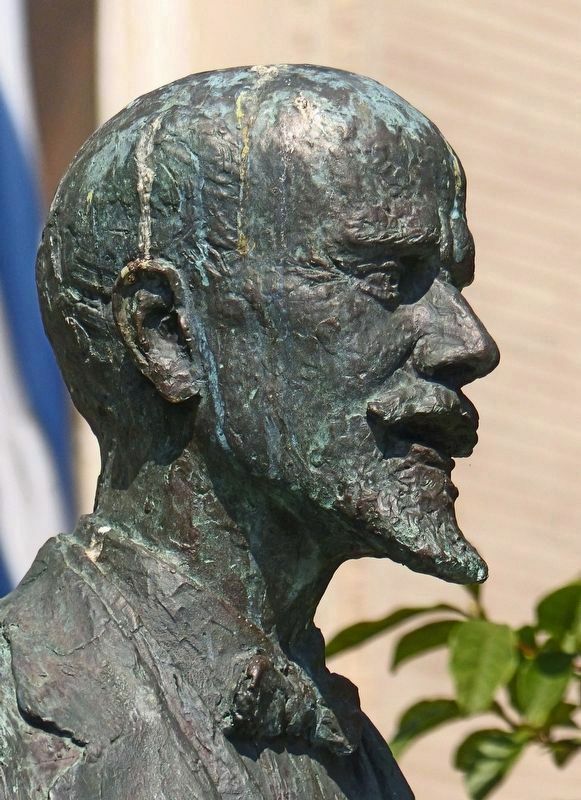 Search the internet for Eleftherios Venizelos. Credits. This page was last revised on March 4, 2017. This page originally submitted on December 3, 2009, by Richard E. Miller of Oxon Hill, Maryland. This page has been viewed 1,424 times since then and 13 times this year. Last updated on January 27, 2011, by Richard E. Miller of Oxon Hill, Maryland. Photos: 1, 2. submitted on December 3, 2009, by Richard E. Miller of Oxon Hill, Maryland. 3, 4. submitted on December 4, 2016, by Allen C. Browne of Silver Spring, Maryland. • Kevin W. was the editor who published this page.